San Francisco, California – January 11, 2018 – Loom Systems, the leading end-to-end AIOps solution for IT issues, today announced the release of its updated virtual IT data analyst, Sophie 2.4. Sophie enables IT teams to work faster and smarter while making organizational AI more accessible. Plus, Sophie is now fully integrated with ServiceNow in order to support opening tickets and tracking statuses. Loom Systems developed Sophie to help streamline IT operations and improve business productivity, ensuring an instantly smooth, uninterrupted customer experience, by providing root cause analysis for issues across the IT stack, and recommendations for resolving problems in real-time before they escalate. By applying machine learning-based algorithms, Loom is able to extract real insights and meaningful information from log analyses, and distinguish patterns in massive amounts of data. Similar patterns can then be identified in the future in order to predict and prevent potential issues that could disrupt an entire system. 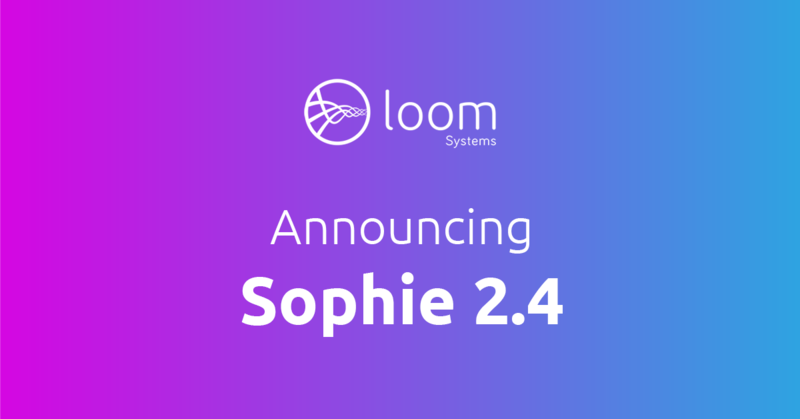 Sophie 2.4 includes a new version of Loom’s patterning algorithm that increases the platform’s precision, enabling it to cluster log patterns more quickly, resulting in faster detection of anomalies. Additionally, Sophie will be integrated with ServiceNow, allowing users to utilize the platform as part of their workflow. They can easily open a ticket in ServiceNow directly from Sophie, and then fill in all essential information and assign it to the relevant IT professionals. Alternatively, users can consume Sophie’s custom alerts within ServiceNow’s UI by using its API. Loom Systems is the leading AI-based log analysis company, providing an end-to-end log monitoring solution. Loom's coherent solution enhances operational excellence, enabling any organization to succeed in the digital era. Loom Systems has been named Gartner's “Cool Vendor for 2017” in Performance Analysis and has recently raised $6 from leading companies: JVP, Meron Capital and 31Ventures Global Innovation Fund. For more information, visit us at: https://www.loomsystems.com and follow us on Twitter @Loom_systems and LinkedIn.